Calabria is a small exclusive villa estate of around 40 homes, located in the Westside development of Kissimmee and only minutes from the new West Gate at Walt Disney World Resort �. Within 15 minutes drive of Calabria you will find the Highway 192 area, with a host of shops, supermarkets, bars and restaurants. Each over sized home at Calabria benefits from beautiful Italian themed architecture and first class fixtures, fittings and appointments. All homes are furnished to an extremely high standard and feature flat screen T.V�s in the lounge along with High Speed Internet access*. Some homes features safes which can be rented locally for a small fee. All of the homes in Calabria back onto conservation areas or lakes giving you extra privacy and the community itself is surrounded by conservation areas and natural wetlands making it the ideal spot to relax and unwind after a day at the theme parks. Every one of the featured homes at Calabria has a private screened swimming pool which can be heated in the Winter months*, they also feature a a sun deck, complete with sun loungers and table and chairs for al fresco style dining. As Orlando�s premiere tourist and commercial destination � encompassing some 1,500 acres southwest of The Walt Disney World Resort � ChampionsGate� welcomes visitors just off its I-4 exit with stately rows of towering palm trees behind the beautifully-designed double gates. With 36 holes of championship golf designed by International golf champion Greg Norman, ChampionsGate is like no other golf resort in the world. The golf resort also features a 35,000 square foot clubhouse which features a pro shop, full-service banquet facility that accommodates up to 300 guests, and a full-service bar. David Leadbetter�the instructor of many world-famous professional golfers, including Nick Price, Ernie Els, Michelle Wie, Trevor Immelman, Ian Poulter and Greg Norman � has chosen ChampionsGate� to be its World Headquarters for the The Leadbetter Golf Academy. You are just a few minutes from Route 192, renowned for its wide selection of restaurants, shops, and attractions.There are air boat rides,helicopter rides, hot air balloon rides, etc. Restaurants catering for Italian,Chinese,American,Mexican, Seafood,Pizza, Pancakes,Burgers, to name but a few! You can visit Congo river golf, Flea markets, Discount stores selling Reebok, perfume, gifts, etc. Outlets just down the street and a quick drive for lots of bargains. You have easy access to all these as well as Disney, SeaWorld, Universal, etc. Enough to keep you busy whatever your interest.You are staying in the Central location and have easy access to the multitude of Golf courses together with recreational facilities. Explore old Town Kissimmee, or spend hours shopping in the retail outlets in and around the Route 192. You are five minutes from the Wal-Mart for your grocery requirements. Emerald Island is surrounded by a conservation area and encompasses over 300 acres of land, including an 11 acre nature area in the middle of the resort. The 550 brightly colored homes ,ranging from 3 bedroom townhouses to large 7 bedroom villas in a Mediterranean style, and were constructed between 2002 and 2005. Today the beautiful dolphin statue at the entrance of the community, together with fountains and manicured lawns, leads to the gatehouse manned 24 hours a day. The 4,000 sq ft clubhouse and all of the facilities here are free for guests to enjoy, these include a modern fitness center, video games arcade, cyber caf�, meeting room and small convenience store. Helpful, friendly staff are on duty throughout the day and evening to assist with arranging transportation, tickets for dinner shows and other general inquiries. The outside pool area offers plenty of loungers and space, a heated swimming pool, hot tub, sauna and steam room, and not forgetting the all-important tiki bar serving drinks and snacks. Also on the community there are tennis and volleyball courts, children�s play areas, BBQ and picnic areas, as well as nature trails for walking, jogging or cycling. Organized activities arranged by the staff include karaoke evenings and movie nights. Disney theme parks are situated just a few miles away and the bustling US192, with its wide range of shops and restaurants, is even closer. The I-4 highway leading to Universal, Sea World, International Drive and the coasts is just a short drive away. 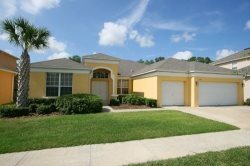 Overview Formosa Gardens in Orlando is a gated community of upscale vacation home rentals, situated just minutes away from Disney and the attractions of Kissimmee, Florida and all of the local shops and restaurants. The exclusive development of Formosa Gardens features extra-large 4, 5, 6 and 7 bedroom vacation homes with pools, all surrounded by extra-large lots, wide boulevards and palm fringed streets. Formosa Gardens Estate also has spectacular lake views from many of the rental homes. This executive community is an ideal vacation location stay for families. Solana Resort is situated only minutes from Disney and near to all the Central Florida theme parks and attractions it is the ideal location for a Florida vacation. Solana Resort is served by a state of the art clubhouse offering a range of amenities you would expect from a top-rated hotel so you can have all the benefits of a resort vacation plus the space, privacy and convenience of a private villa rental home. Windsor Hills has all the amenities of a 5 star hotel or resort, but with the comfort, convenience, and privacy of a high end home. These gorgeous homes offer twice the amenities at a small fraction of the cost of staying in a traditional theme park resort hotel room. Who wants to spend their vacation in a cramped one room hotel room when you can enjoy an incredible home in an amazing resort that is as close to Disney as many of their own properties? The most impressive feature is our location, just 5 minutes to Disney! © 2019 | First Class Florida Villas - All rights reserved.